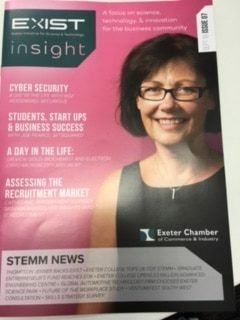 The September edition of Insight, the Exeter Initiative for Science and Technology (EXIST) magazine, features a day in the life of Roz Woodward, discussing Cyber Security in Exeter and the South West Cyber Security Cluster. Securious specialises in cyber security compliance and is based at the Science Park Centre in Exeter, Devon. Roz Woodward, a director and co-founder, speaks to Insight magazine about Securious and their active role in developing talent in the South West. encourage investment in the STEMM industries in the region. Insight magazine aims to raise recognition of the STEMM organisations and its community within Exeter and the local region. Insight encourages increased visibility of Exeter as a science city. Insight includes an article for cyber security with “A day in the life with Roz Woodward. It describes how Securious enable clients to demonstrate that they are taking cyber security seriously. Insight speaks about Securious’ strategy to provide qualified industry specialists for cyber security in Exeter and develop talent in the South West. The South West Cyber Security Cluster (SWCSC) is a not for profit collaboration working in partnership with Devon and Cornwall police raising cyber security awareness in the region and best practice in the South West.